Facing down, place yourself on the ground with your hands flat on the floor, directly below your shoulders. Place your feet on top of a bench or box. Only your toes and balls of your feet should be touching the floor. 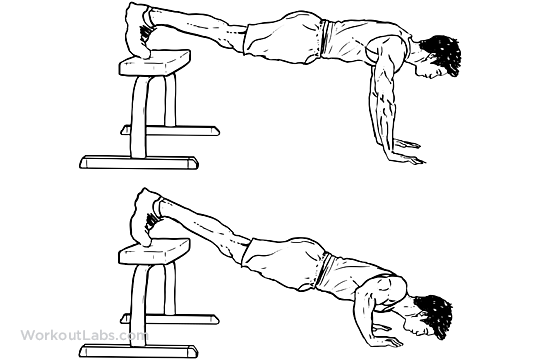 Maintain a flat back and tight core before lowering your chest towards the ground. Bend your elbows at a 60-degree angle until your chest is just above the ground. You should feel a stretch across your chest. Hold for a count of one. Push yourself back to the starting position by straightening your arms. Do not lock out your elbows.